Mustafa Kaya: "what Agendas Are We Talking About'"
›Mustafa Kaya: "What agendas are we talking about?" Mustafa Kaya: "What agendas are we talking about?" Milli Gazete columnist Mustafa Kaya writes on upcoming local elections. Here is the full article. Local elections are less than two months away. With every passing day, we are witnessing that discussions are increasing their intensity. 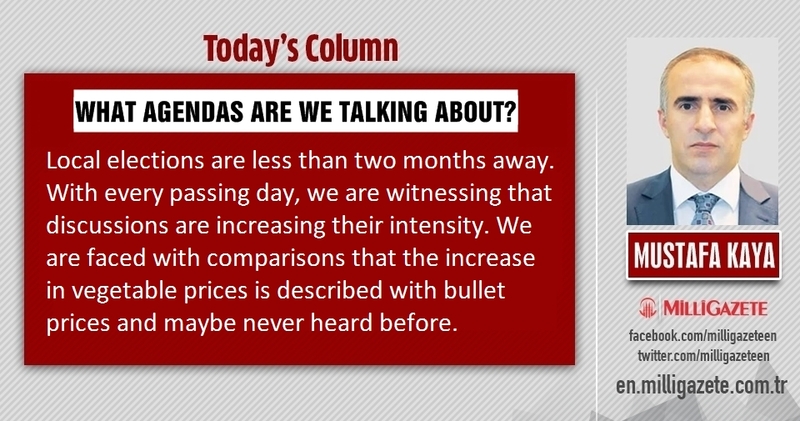 We are faced with comparisons that the increase in vegetable prices is described with bullet prices and maybe never heard before. We see that security concerns are highlighted to not give the opportunity to talk problem or problems. The policy is consistently losing blood. It shows itself nearly in all speeches that the ruling wing, or the parties forming the Presidency of the Alliance have no worry about to reach the entire society. The priority for them is to preserve their positions in June 24 elections. They are so blinded by the anger that they can use the insults such as disgrace and malady. They are like focused on the scoreboard when they do it. They fouled the opponent player, scored a goal shotting the eye of referee and they think believe that it has no importance. I had been cheated in a Turkey Championship in Eskisehir by the player of the opponent team because of narrowing the movement area. He had cursed when he realized that he couldn’t get rid of marking and then brought me into becoming tough, and he had managed to limit me to himself by making me to have a yellow card. And now, the ruling party at the outset, the Presidency of the Alliance is exactly acting like that. In order to demonize the opponent, they spread the fiction informations first. Till the opponent tries to express itself, by repeating the same lie with the media power in their hands they start to believe themselves too. I am going to say that they are being unfair but now that such the warnings are met with a derisive smile fort hem, I do not want to contribute to the emptying of this concept a little more in vain. But I can say this easily. This political approach is rapidly moving towards a point that cannot be moved. It’s precise that there is an awakening. I don’t know how this situation will reflect to the polls. Expressions such as “if it’s thief, it is our thief” are starting to give evidence as a proof that the spear does not fit in sack. They made it fall such down through the floor by using the diametrically opposed discourses oftenly like the traitor and patriotic that as in other concepts they didn’t see a harm in emptying these. This power does not start without a calculation of how a job will return to themselves as a vote in polls when they are doing a job or talking about a matter. When they do so, there is nothing in the name of fertility. Whereas, the solutions of our problems wasn’t possible with the attacks on our perceptions and it won’t be anymore. The society started to hate this perception games. We are going to a local election but can you see what agendas we are talking about?